This is the 19th day in a series: 31 Days of Memory Keeping. Check out all the posts here. Birthdays are a big deal in our house. We have fun, magical parties (with themes like Elmo and trains) and take tons of photos. 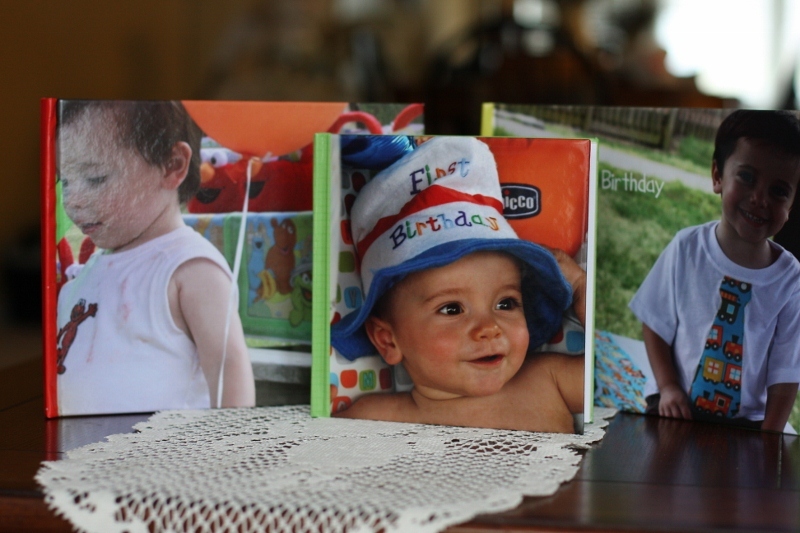 You can look at Elias’s first birthday book here. Another birthday memory keeping product that I love and use is the Blessings Unlimited Birthday Book. These books make birthday memory keeping SO easy. Each year has a single page and large pocket page. On the single page, you glue in a photo, write about the day and birthday milestones. In the pocket you tuck a few bits about the birthday celebration (like the invitation, additional photos, etc.). SO COOL and SO EASY. I have a book for each of my kids and love to give it as shower or first birthday gifts. It is such a simple concept, but such a meaningful keepsake. Plus, it’s also only $24, which I think is a great price for a keepsakes that will be used for so many years. My mom had a school years book like this for my sister and me, and I still love to look at it. When my kids are older, I hope that they will look at these books and remember the wonderful ways we celebrated them. So you do a yearly photo book for each child plus a Project Life book? Do you use some of the same pictures in each book? I guess I am trying to figure it all out. Yes, I definitely use some of the same photos. We take about 12,000 photos a year. Only 365 make it into Project Life. The annual album for each child allows me to document/print a lot more photos + the focus is on that child. Project Life is really family focused for us and not specific to just one child. I found your blog via MoneySavingMom and just wanted to say how inspiring it has been to me! I love to scrapbook and like to think of myself as a fairly good photographer but I am so bad about actually doing either of these things and keeping record of our daily lives. You have given me so many great ideas that I am actually going to use and you keep it simple. I also love the suggestions for the different memory scrapbooks that make it easy to actually record life. Thanks for the great inspiring series and for sharing helpful tips! Becca – welcome! Thanks so much for your kind words and for joining in the 31 Days fun. I am so glad you have been inspired. I gave my sister a birthday book for my niece’s first birthday. It’s a great gift. The one I got has interview pages as the child gets older so you can record special things about them. I found your blog via Becky Higgins. Thank you for all the different ideas that you have provided for keeping memories. I love photo books we made the grandparents some of our daughter, birth-6months, 7months-1yr, & then 1yr-2yr, as Christmas presents they love them. It is harder now cause she doesn’t sit still for photos like she use too. I have made a book for each of her first 2 birthdays [haven’t gotten around to the 3rd yet] but she loves to look at them. I’ll be checking out the journals you mentioned & the birthday book from this post! Thanks again!